Beautiful 2 story house on Smith River- Private Beach, Trails,& More! 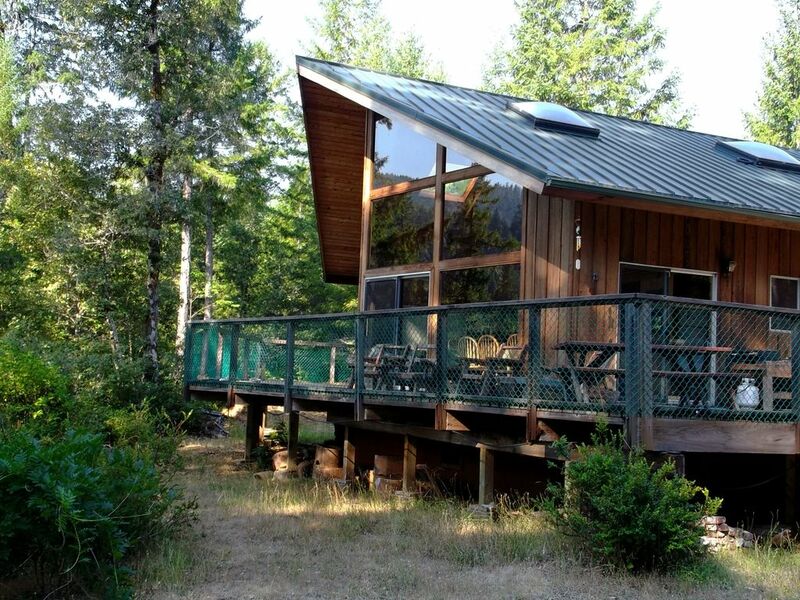 A gorgeous drive along the South Fork of the Smith River gets you to this luxurious river side house located in an area named 'Big Flat' as it is a big flat area high in the mountains where the inland tribes gathered to meet the coastal tribes. Rich in natural history and scenic beauty, this is the type of place one wants to check in, and 'check out'. Surrounded by the sights and sounds of the river rushing by as well as a multitude of songbirds and miles of majestic wilderness, there is opportunity for swimming, rafting, tubing, hiking, cycling, fishing, kayaking or just laying on the river view deck soaking up the sun in summer or snuggling by the fire in colder months. The house affords the ability to rough it in great comfort as it has full amenities while being off the grid, we have equipped it with solar power and propane appliances.Due to the solar power system capacity--- microwaves,toasters,hairdriers and other resistance appliances will drain the system. property is on the Smith River and not where map shows it.....property actually crosses the river. not at house but emergency phones are on main road operated by forest service....very close to house. propane powered and recovery time is slower than electric.Open and close quickly in warm weather.Has small freezer as well. We had the pleasure of staying at this cabin for Thanksgiving. It was warm, cozy and very remote. Solar electricity was new to us as was generator use. We got there in time for it to rain constantly for two days. We lost lights on the second night. Luckily the owner left directions and we figured out how to use the generator. The cabin was right on the river. It was beautiful but because of the rain we couldn’t take the trail down to the beach. We did see a deer right outside our door. My only complaint was the rain, but obviously that can’t be helped. I would recommend this place as a relaxing, remote place to enjoy during the summer. There was so much more we couldn’t do because of the constant rain but the cabin left us warm and dry. Nice place to get away, off the Grid. House is very roomy. Walking down to the River is fun, it feels like being out in the wild. Breath taking!!! Amazing family fun! This place was everything we hoped for! A total disconnect from technology... it was a beautiful family vacation full of memories ! The river is stunning and this is the perfect location to recharge and being in contact with the beauty! My family and I had a wonderful time staying in this beautiful cabin on the river. It was so nice to be off-the-grid and out of cell service for five days - we all feel renewed and we've made family memories that will last a lifetime. Thank you Jim! We loved this cabin and had a great time swimming in the creek. It is a perfect of the grid place to stay!